Air in the steam will cause the temperatures on heat-exchangers surfaces to be lower than expected due to the saturation temperatures in the steam tables. The heat transfer will be reduced and the system efficiency will be decreased. Air in steam can be described with the "Daltons Law of Partial Pressure". The total pressure exerted by a mixture of gases is the sum of the partial pressures of the individual gases! 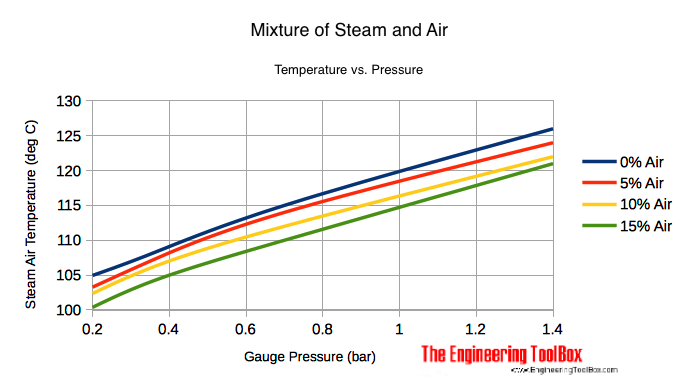 Reducing the part of steam reduces the effective steam pressure. Increasing the part of steam (until 100%) increases the effective pressure. Important! Since the steam has an effective pressure of 3.75 bar instead of the pressure of 5 bar a, the mixture would have a temperature of approximately 139 oC rather than the expected saturation temperature of 152 oC. This has a major effect on the heat transfer capability of an heat exchanger. Engineering ToolBox, (2003). Air and Steam Mixture. [online] Available at: https://www.engineeringtoolbox.com/steam-air-mixture-d_427.html [Accessed Day Mo. Year].